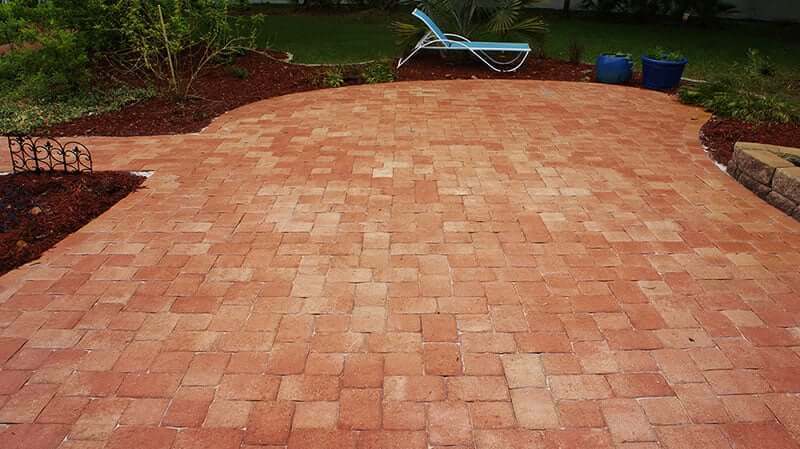 Peter’s Pressure Washing is one of the best “paver sealing” and cleaning services in Tampa Bay, Florida. We offer a wide variety of “paver cleaning” and restoration services including paver stripping, paver restoration, translucent tint and stain for pavers, re-sanding paver joints, brick paver sealing, concrete paver sealing, and driveway “paver sealing”. Since we began offering “paver cleaning and sealing” services in 2012, we have since remained on the cutting edge of innovation in the industry, using only the highest quality paver sealer and state-of-the-art equipment. We offer customized paver sealing solutions for every style paver. Sometimes the condition of the paver will dictate the solution needed. Problems with pavers often occur because they are not properly maintained. Sometimes pavers are sold as “maintenance free” pavement; however, they do require maintenance, as do all outdoor surfaces subject to exposure to the elements. Failure to replenish joint sand, seal the pavers, and stabilize the joints, will inevitably lead to bigger maintenance issues down the road such as settling, surface erosion, permanent staining, and fading/discoloration. 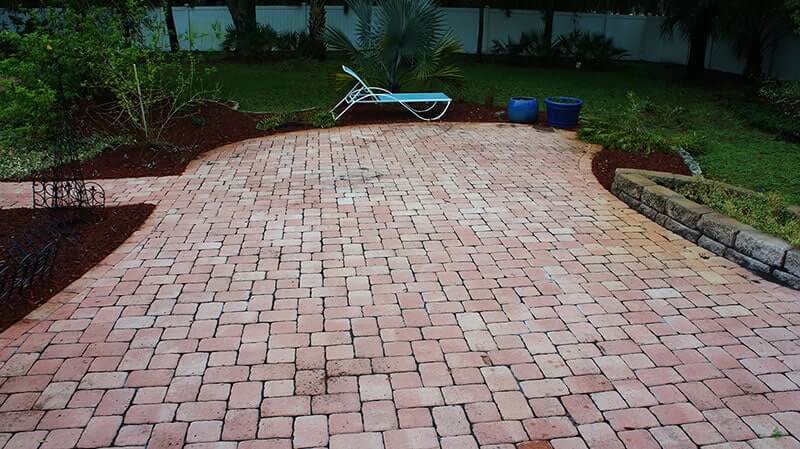 This can result in needing paver restoration services that we provide. The most important thing to keep in mind when sealing your pavers is that if the job is done incorrectly, the cost to fix it is extremely high. This is why it’s important to make sure that the company you are hiring offers a warranty against the sealer failing. There are many reasons a sealer may fail. When a sealer begins to fail it will develop what’s called a “whiting issue”. To help you visualize just how unsightly a whiting issue actually is the picture below shows what sealed pavers should look like vs. what they can look like a paver sealer fails. The customer in the photo below went with a company that was half our price, but then ended up paying three times our original price to have us strip and reseal the pavers with a high-quality brick paver sealer. Over the years many “solutions” have been offered to deal with the potential maintenance issues that the owners of interlocking concrete pavers face. Primary among them was the introduction of solvent-based acrylic sealers, water-based sealers, and stabilized joint sands. These attempted solutions added some benefits while creating other problems of their own. Even today, for every one good product on the market there is at least a hundred terrible products. Ure-Seal H2O is two-part water reducible high-performance urethane sealer. It will not yellow, peal, or develop whiting issues when professionally installed. It is important to remember that any sealer can fail when installing incorrectly or without proper surface prep. Ure-Seal has outstanding chemical resistance and forms a very hard protective coating. These products were introduced primarily to comply with lower VOC limits required by several states and to reduce toxic exposure for contractors and the environment. These are traditionally single stage chemicals that tend not to be very durable and also have the risk of “blushing” (trapping water vapor) thus turning white. Some have the ability to provide joint stabilization but have been found to wear prematurely. Most water-based sealers “low volume of solids”. This is a fancy way of saying that they are mostly water. This is a negative thing when you are trying to build a protective film-forming coating that will protect your pavers for years to come. Sadly, traditional water-based sealers usually only last one year at best. Solvent-based sealers are another option, but they are notorious for “whiting issues”. They are not breathable coatings and therefore they trap water vapor. When the water vapor gets trapped it then breaks the sealers bond causing the sealer to fail. Unlike water-based these sealers are “high volume of solids”, which means they typically build a significant film forming a layer. This, however, turns out to be a big problem when the sealer turns cloudy and needs to be stripped. Solvent-based sealers are among the hardest and most costly to strip, and they are the most common to turn white. Another concern with solvent-based sealers is toxicity. They have a very high VOC (volatile organic compounds) rating. They contain carcinogens which are extremely harmful to humans and animals to breath. Exposure to carcinogens has been linked to causing birth defects, Alzheimer’s, and even cancer. Solvent-based sealers typically use an acrylic resin to seal the pavers. Acrylic coatings have been around for a long time and are still very common to find being used by contractors, however, urethane technology has proven to be a better resin that bonds better and lasts longer. Peter’s Pressure Washing only uses breathable water based two component pure urethane sealers. While these sealers are more expensive, they are worth every penny. Engineered joint sands such as polymeric sand were developed years ago to try and address industry concerns around weed growth and joint sand depletion. While they can be helpful in some paver install situations, they are completely unnecessary when the paver is being sealed with Ure-Seal H2O. Additionally, and most importantly, they create an increased risk to the contractor and the owner because they can often leave a “poly-haze” on the pavers from polymers left on the paver surface or stuck in the paver pores. At the end of the day, none of the above “solutions” provided a comprehensive resolution to all the issues facing the interlocking paving stone industry. Paver Cleaning and Sealing: Finally a Solution! The Ure-Seal system was developed to create a comprehensive answer to the industry’s need for a maintenance solution – without creating any additional issues. Ure-Seal sealers apply a semi-penetrating film to the surface of the pavers while simultaneously stabilizing the joint sand using compounds in the sealer to bind the sand particles. Ure-Seal is innovatively engineered to release moisture as the sealer cures, so the sealer may be applied on damp surfaces with no risk of blushing, yellowing, or trapped moisture. Since UreSeal H2O is water-based there are no toxicity concerns. We believe UreSeal H2O is the best choice currently on the market for sealing brick pavers. From beginning to end we are fully equipped to provide the absolute highest level of quality to our customers! How long can I expect the sealer to last before it needs to be re-sealed? There are some variables at play here such as paver absorption rate, density, exposure to elements, traffic patterns, etc; but in general you can expect 3-5 years before it’s time to reseal the pavers. Will Seal 'n Lock ever turn white or need to be stripped? No! Seal ‘n Lock will not turn white or ever need to be stripped, and every job is backed by our Whiting Issue Warranty. My pavers have been sealed before, can they be resealed with Seal n' Lock? This depends on the sealer that was used and the condition that it’s in. We can determine these factors by testing during a free consultation. Can Seal 'n Lock be used on travertine? Yes, Seal ‘n Lock is a fantastic product for travertine! Will the pavers be slippery when wet after they are sealed? No! Although many sealers give you this problem Seal n’ Lock does not. We have never had this complaint with Seal ‘n Lock on pavers. Does the sealer have any harmful affects for plants, pets, or people? No, Seal ‘n Lock is an Ultra-Low VOC products. It contains no harmful solvents or chemicals unlike Oil-based sealers. It is safe for plants, pets, and people. What areas do you service for paver sealing? We offer paver sealing services for Tampa, Wesley Chapel, New Tampa, Zephyrhills, Riverview, Apollo Beach, Ruskin, Gibsonton, Sun City, Wimauma, Seffner, Valrico, Dover, Brandon, Lithia, Plant City, Temple Terrace, South Tampa, and New Tampa.